Postoperative spindle cell nodules (PSCNs) are benign, localized, reactive lesions  usually described as histologically identical to inflammatory myofibroblastic tumors (IMTs), except that a history of instrumentation or trauma to the bladder (eg, core needle biopsy, surgery) can be elicited (see the image below). [2, 3, 4, 5, 6] PSCNs are polypoid or nodular and involve any portion of the bladder wall, most commonly the dome. Postoperative spindle cell nodule of the bladder, with muscularis propria on the left. Males are affected more commonly than females, with a male-to-female ratio ranging from 2:1  to 3:1. [3, 4] The first large series of 38 cases comprised patients aged 2.5 months to 87 years. The mean patient age was 65 years. Hematuria is the most common presenting symptom, present in most patients, followed by bladder outlet obstruction and dysuria. Plasma cells are often less prominent than in inflammatory IMTs. Micci F, Haugom L, Abeler VM, Bjerkehagen B, Heim S. Trisomy 7 in postoperative spindle cell nodules. Cancer Genet Cytogenet. 2007 Apr 15. 174 (2):147-50. [Medline]. Montgomery EA, Shuster DD, Burkart AL, et al. Inflammatory myofibroblastic tumors of the urinary tract: a clinicopathologic study of 46 cases, including a malignant example inflammatory fibrosarcoma and a subset associated with high-grade urothelial carcinoma. Am J Surg Pathol. 2006 Dec. 30 (12):1502-12. [Medline]. 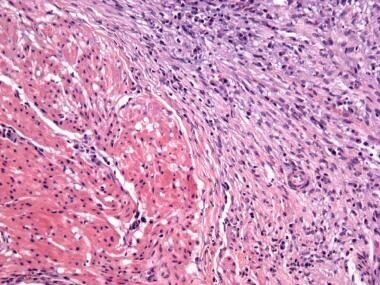 Harik LR, Merino C, Coindre JM, Amin MB, Pedeutour F, Weiss SW. Pseudosarcomatous myofibroblastic proliferations of the bladder: a clinicopathologic study of 42 cases. Am J Surg Pathol. 2006 Jul. 30 (7):787-94. [Medline]. Iczkowski KA, Shanks JH, Gadaleanu V, et al. Inflammatory pseudotumor and sarcoma of urinary bladder: differential diagnosis and outcome in thirty-eight spindle cell neoplasms. Mod Pathol. 2001 Oct. 14 (10):1043-51. [Medline]. Njim L, Dhouibi A, Binous Y, Touil N, Zakhama A, Moussa A. [Pseudosarcomatous myofibroblastic proliferation of the bladder] [French]. Prog Urol. 2010 Apr. 20 (4):307-10. [Medline]. Kim YJ, Seo M, Sohn YM, Shin SY. Incidentally found postoperative spindle cell nodule of the breast 6 months after ultrasound-guided vacuum-assisted excision. Ultrasound Q. 2017 Mar. 33 (1):55-7. [Medline]. Tsuzuki T, Magi-Galluzzi C, Epstein JI. ALK-1 expression in inflammatory myofibroblastic tumor of the urinary bladder. Am J Surg Pathol. 2004 Dec. 28 (12):1609-14. [Medline]. Freeman A, Geddes N, Munson P, et al. Anaplastic lymphoma kinase (ALK 1) staining and molecular analysis in inflammatory myofibroblastic tumours of the bladder: a preliminary clinicopathological study of nine cases and review of the literature. Mod Pathol. 2004 Jul. 17 (7):765-71. [Medline]. Kim SW, Oh YL, Choi JY, Lee JI, Chung JH, Kim JS. Postoperative spindle cell nodule after thyroidectomy: a case mimicking recurrence with anaplastic transformation of thyroid cancer. Head Neck. 2013 Jan. 35 (1):E13-7. [Medline]. Sukov WR, Cheville JC, Carlson AW, et al. Utility of ALK-1 protein expression and ALK rearrangements in distinguishing inflammatory myofibroblastic tumor from malignant spindle cell lesions of the urinary bladder. Mod Pathol. 2007 May. 20 (5):592-603. [Medline]. Zhao J, Ping H, Xing N. Postoperative spindle cell nodule of the bladder: a case report and review of the literature. Oncol Lett. 2014 May. 7 (5):1507-10. [Medline]. [Full Text]. Young RH. Tumor-like lesions of the urinary bladder. Mod Pathol. 2009 Jun. 22 suppl 2:S37-52. [Medline].